An exuberant tour of cities, real and imaginary, far and wide. An epigraph from Italo Calvino’s Invisible Cities—“Cities, like dreams, are made of desires and fears…everything conceals something else”—sets the stage for Scotland-based Irish writer Anderson’s (Serge Gainsbourg’s Histoire de Melody Nelson, 2013, etc.) “diminished non-fiction mirror” of Calvino’s book. Though Anderson lacks the Italian master’s poetic style, he makes up for it with energy and learning. 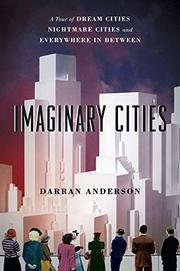 He notes that a history of “ever-changing cities, whether real or unreal, must also be a history of the imagination.” Anderson’s approach owes much to the psychogeography school of thought and the seminal works of Borges and W.G. Sebald and recent writers like Iain Sinclair and Will Self. Rather than walk his cities, Anderson draws upon a postmodernist mashup of history, literature, film, art, philosophy, architecture, video games, and pop culture to weave in and out of them. A distant cousin to Robert Burton’s Anatomy of Melancholy, Anderson’s idiosyncratic and loosely organized compendium is filled to the brim with quotes and references. He opens with Marco Polo and his tales of the many cities he visited, real and fanciful. Then it’s off to Coleridge and his laudanum-infused city of Xanadu. Anderson then quickly infuses his commentary with Homer, engraver Theorodor de Brys, and poet Comte de Lautréamont by way of Cormac McCarthy’s Blood Meridian. Then comes Goya, De Quincey, and Doré, all in the space of three pages. Written in an aphoristic, epigrammatic style, Anderson’s cascade of language and sources borders on the rambling. His discussions about cities and how they have been created and explored in history and myth become hard to follow. There’s much to admire here, but the sheer mass of information—and hundreds of footnotes, many quite fascinating (“the subliminal sense of unease towards pleasure parks is evident in the ease with which it is turned into dystopia—Westworld, The Prisoner, Eurobosch, Tommy’s Holiday Camp”)—often overwhelms. Anderson provides plenty of fodder for academic audiences.